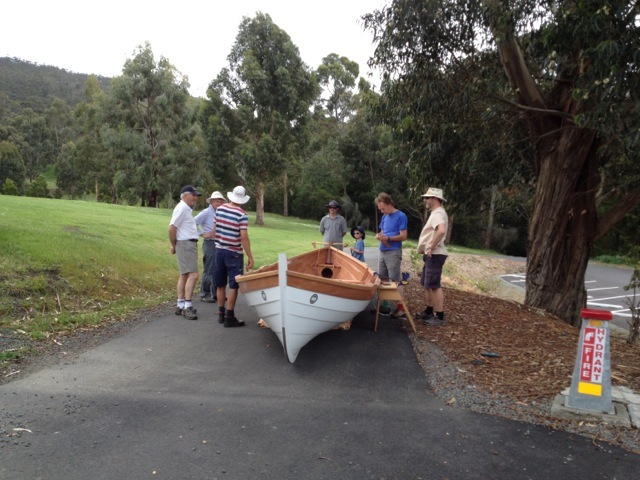 Using a borrowed trailer, the Chiton is prepared for the journey to Franklin. 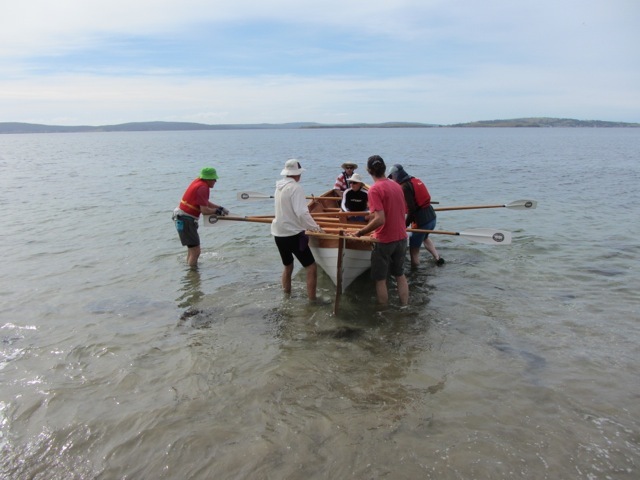 And our first challenge, a 10 km row to Shipwrights Point! 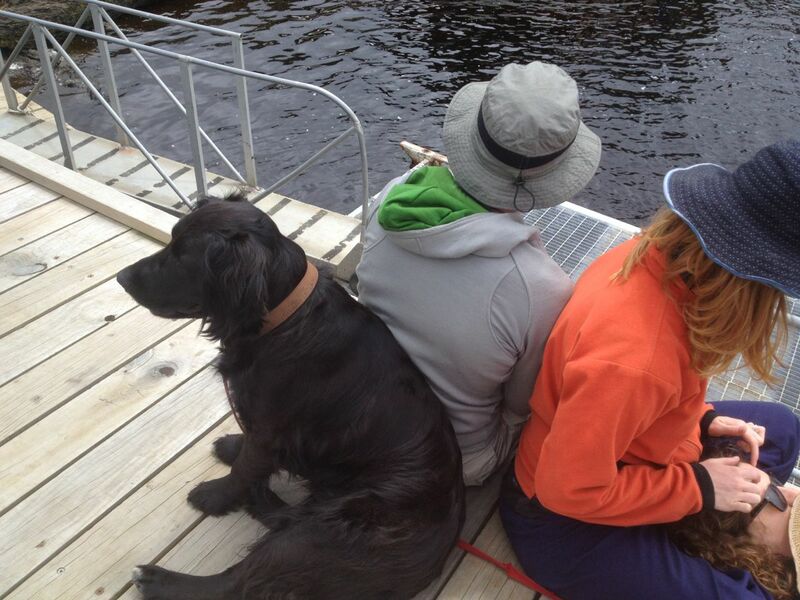 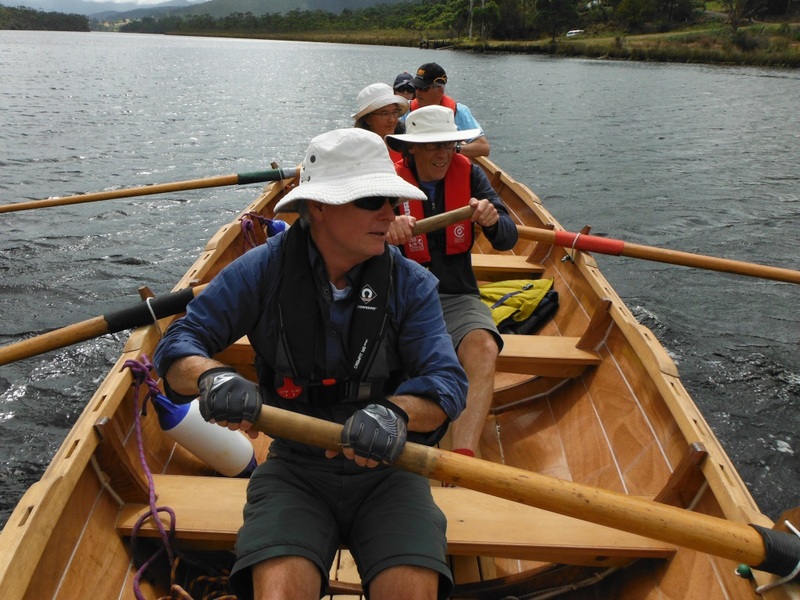 than our nice scooped touring oars. 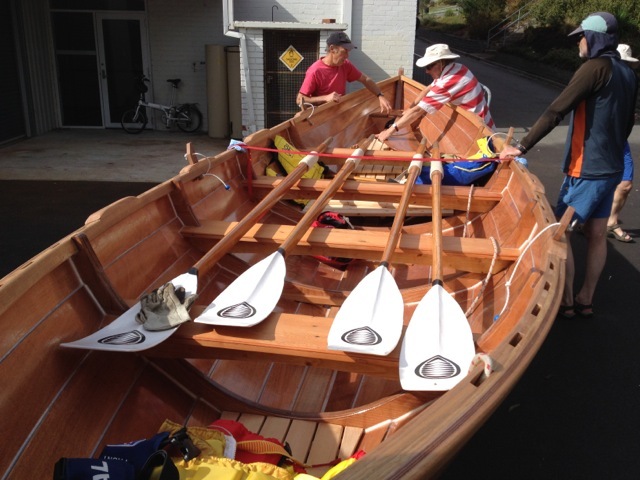 Eastern shore, here we come! 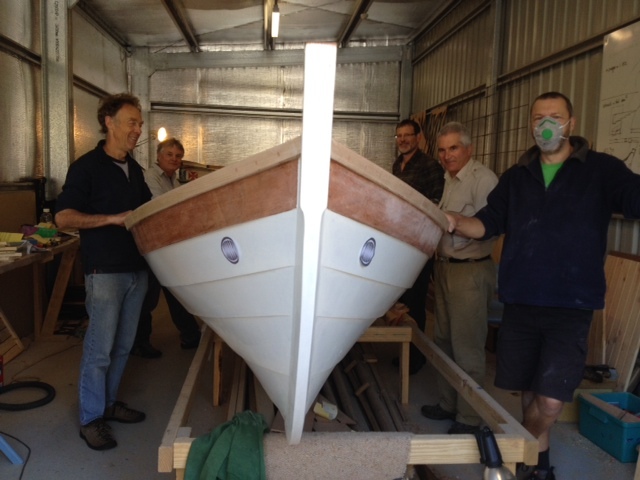 Launch Day – well lads, this is the big day. 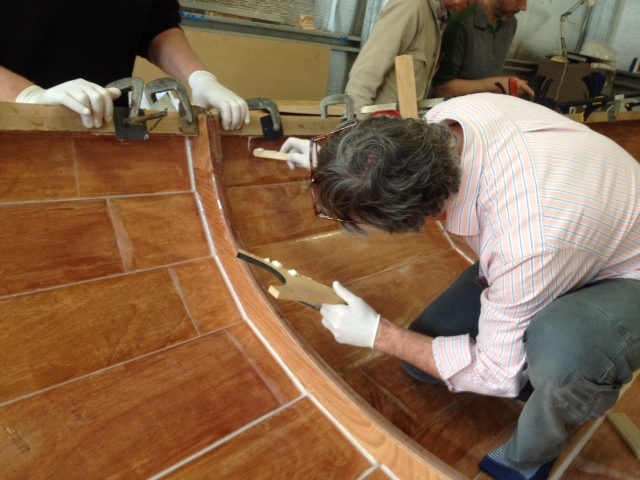 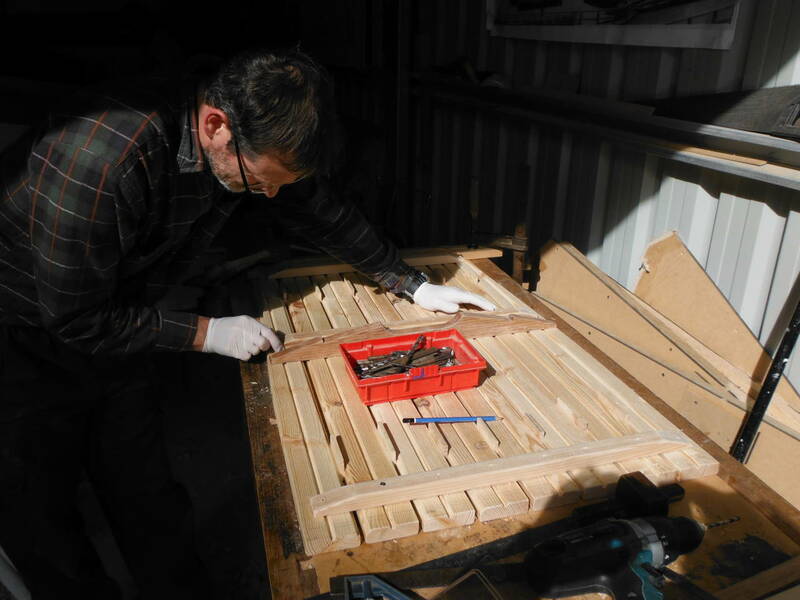 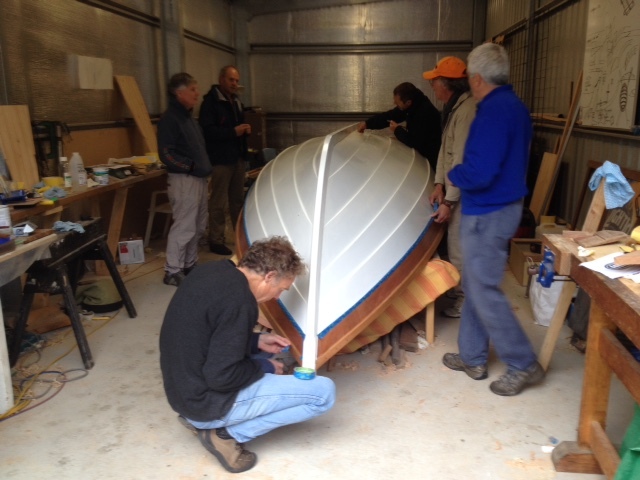 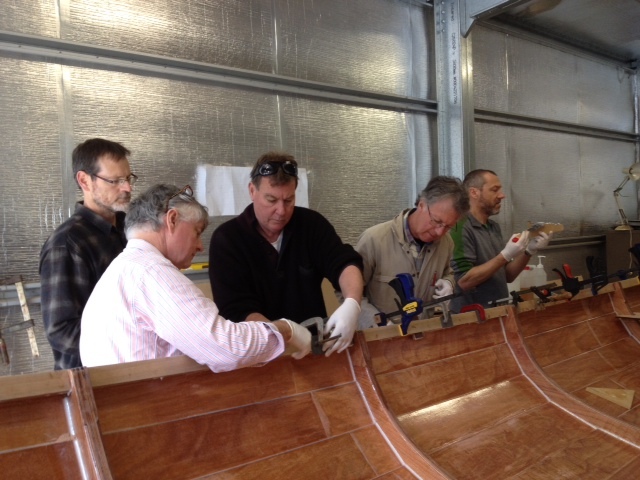 Skiff turned over for final coat of paint – two days to launch! 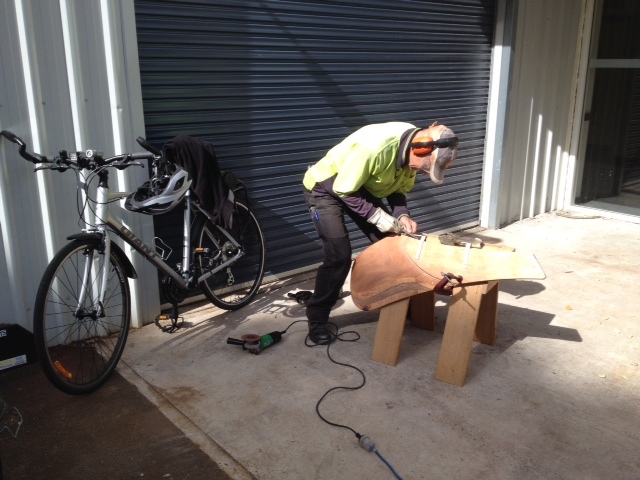 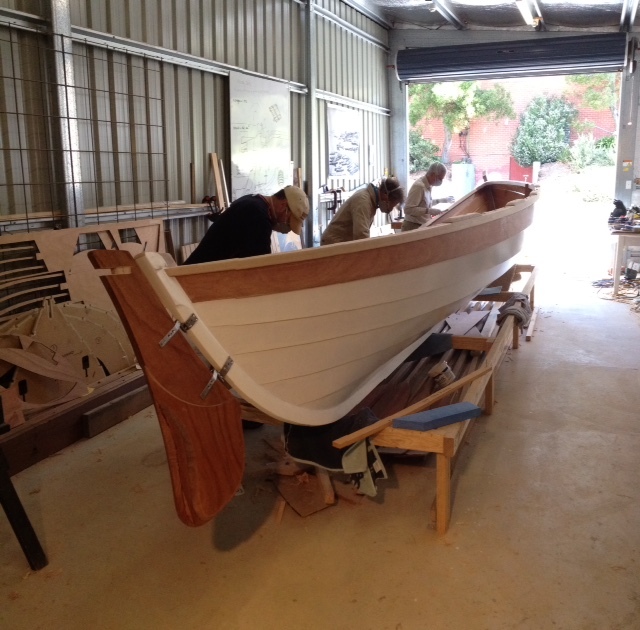 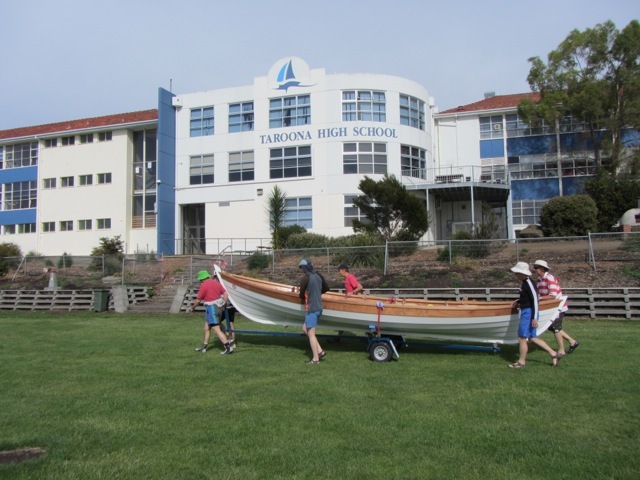 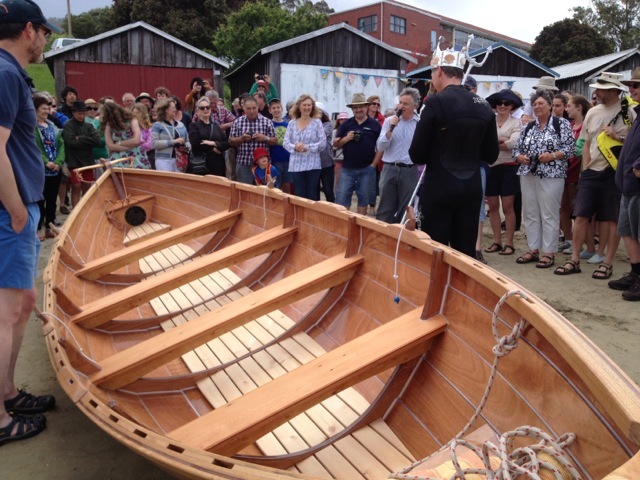 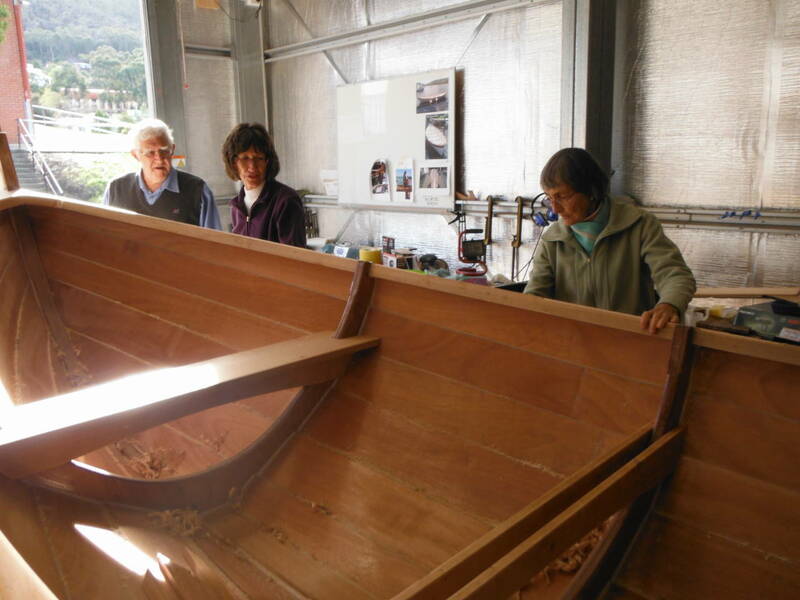 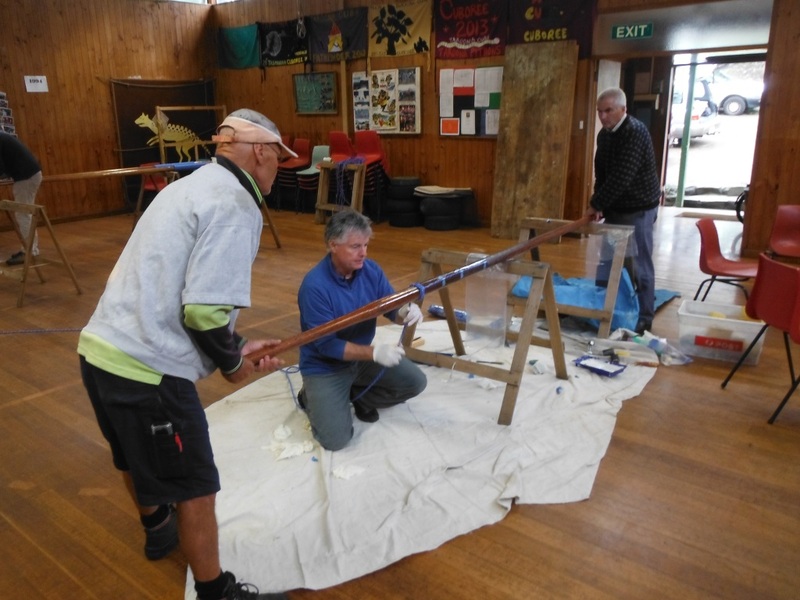 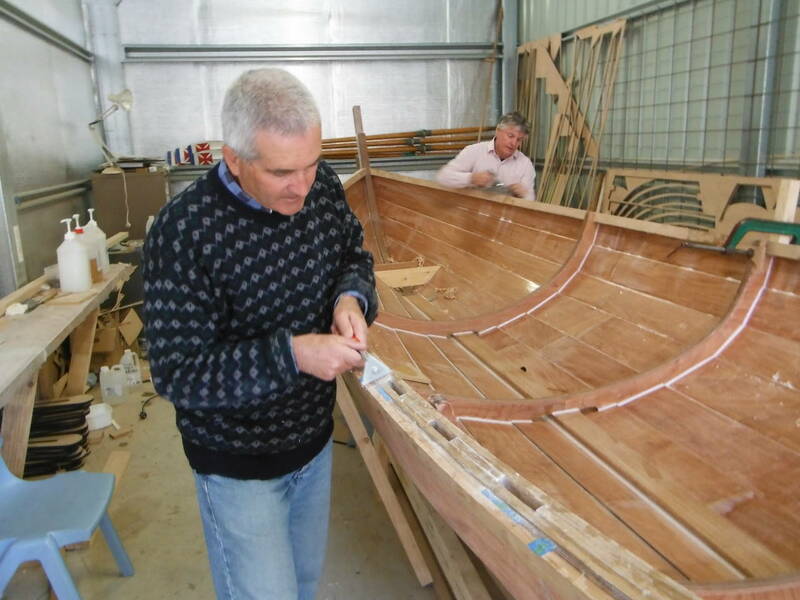 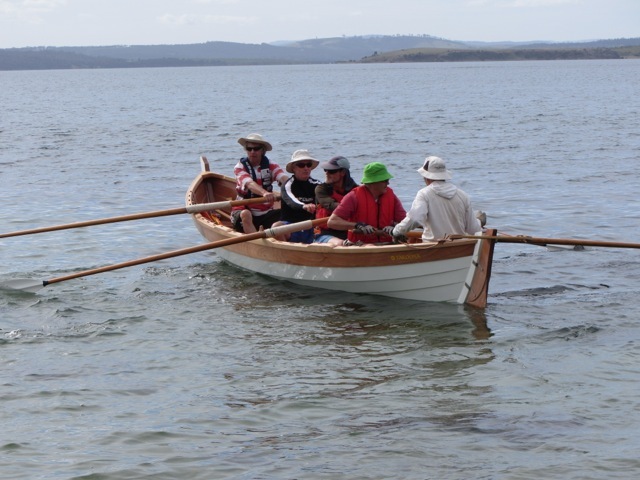 The Taroona Community Association has great pleasure in inviting you to celebrate the launch of our 22 foot St Ayles Skiff, the Chiton carefully crafted over the last year by a group of community volunteers, working out of the Taroona High School bus shelter. 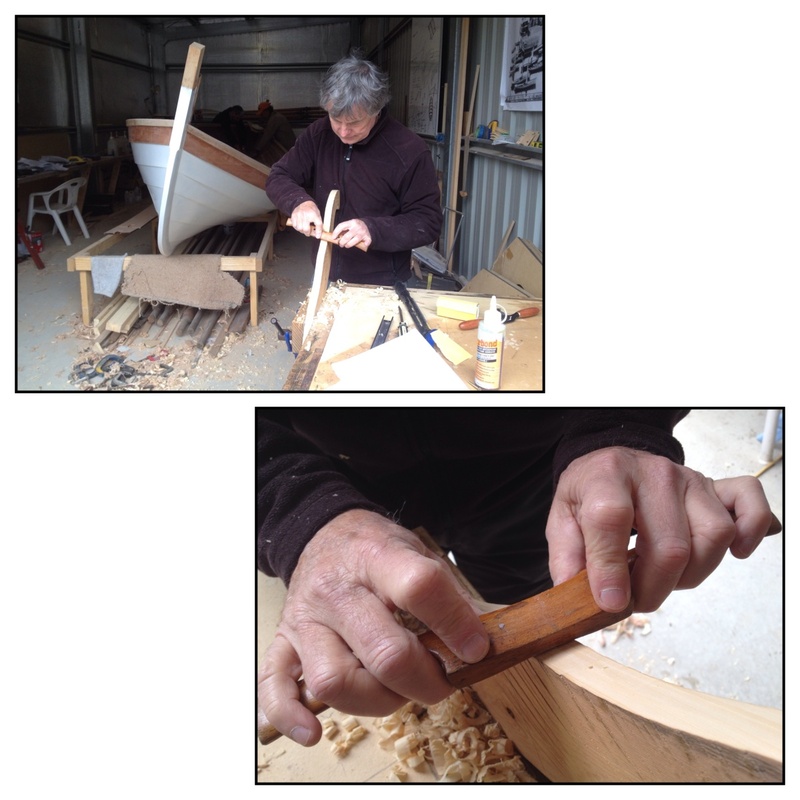 As you read this, our committed group of builders are putting the last lick of paint and finishing touches to this light, beautiful and strong, open water rowing craft. 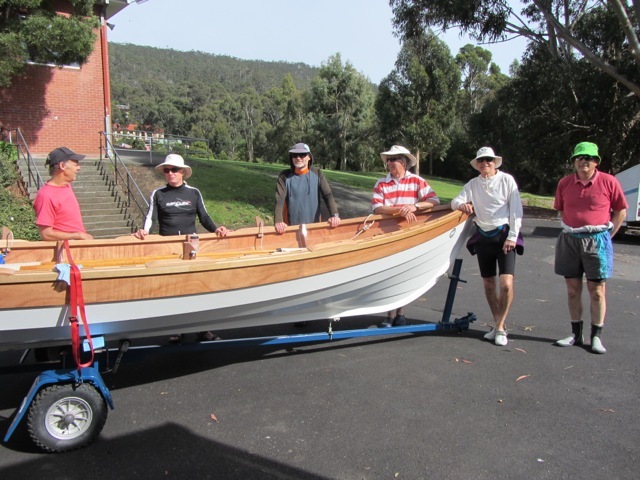 The launch gives us the opportunity to formally thank the many people who have supported the project including Kingborough Council, Taroona High School, our mentors and many kind friends who donated their cash, time, timber and good humour to the project. 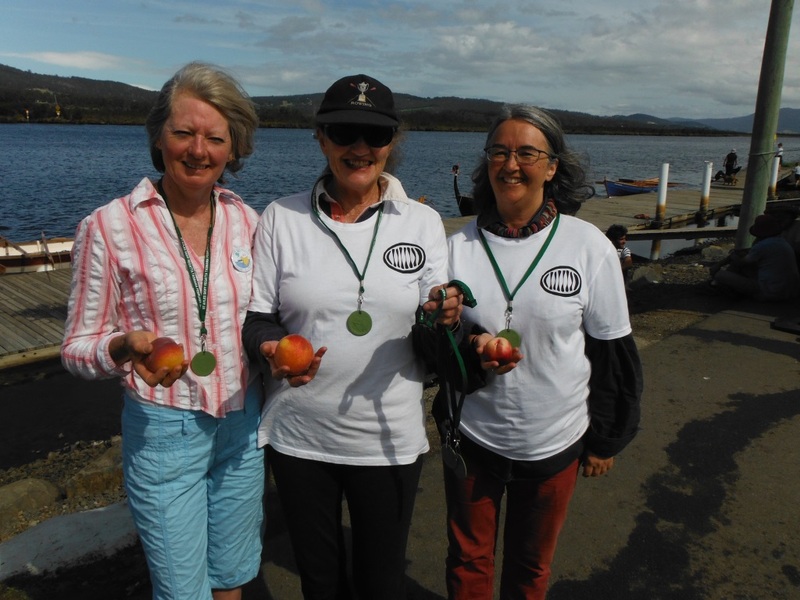 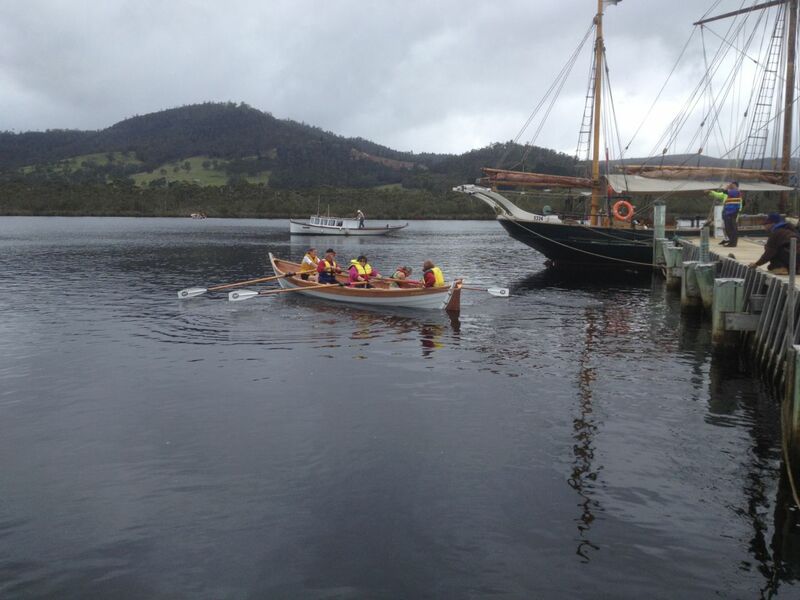 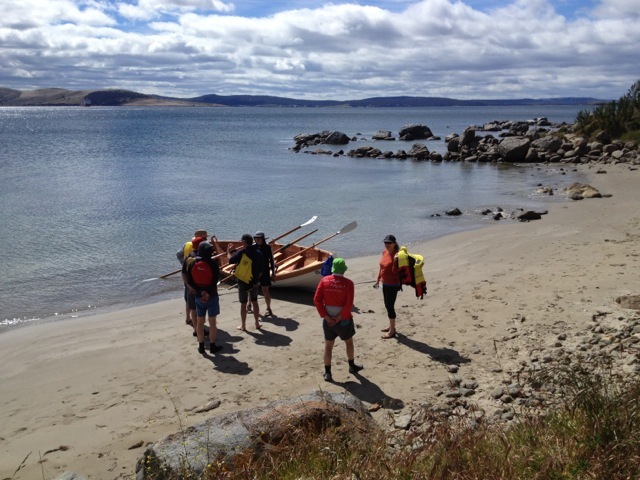 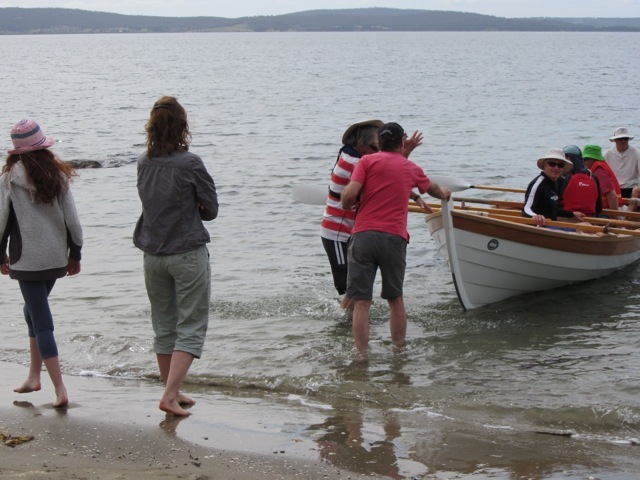 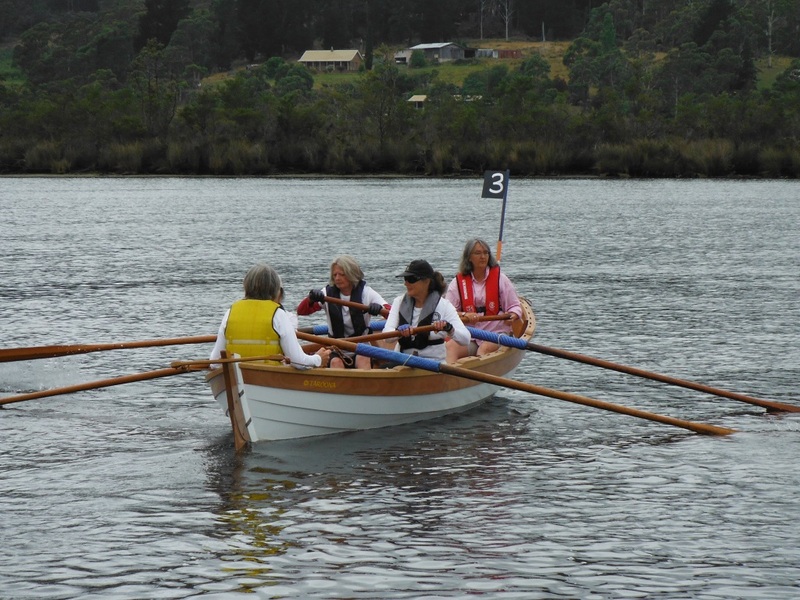 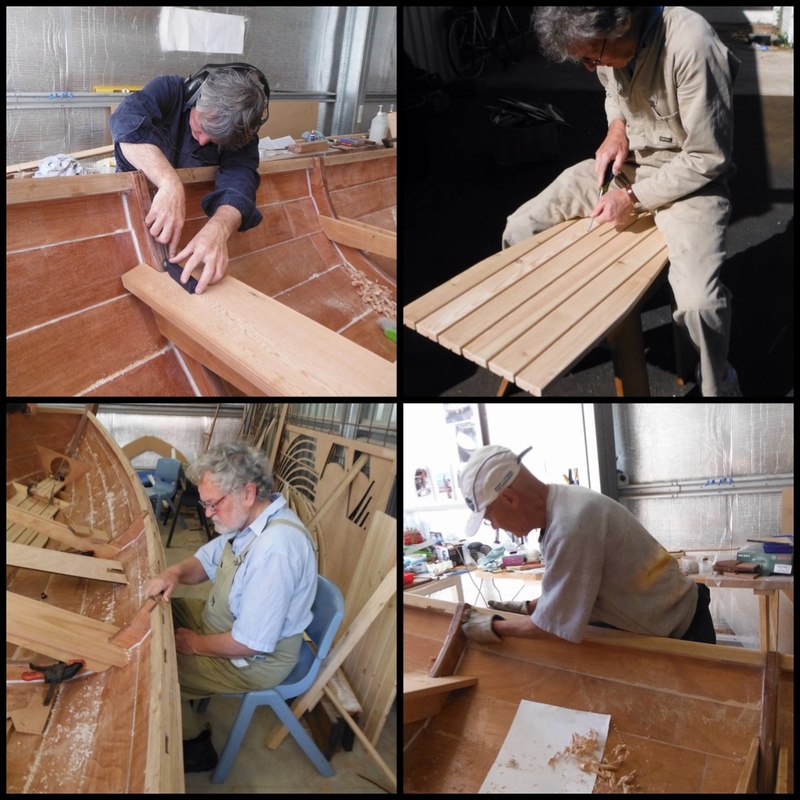 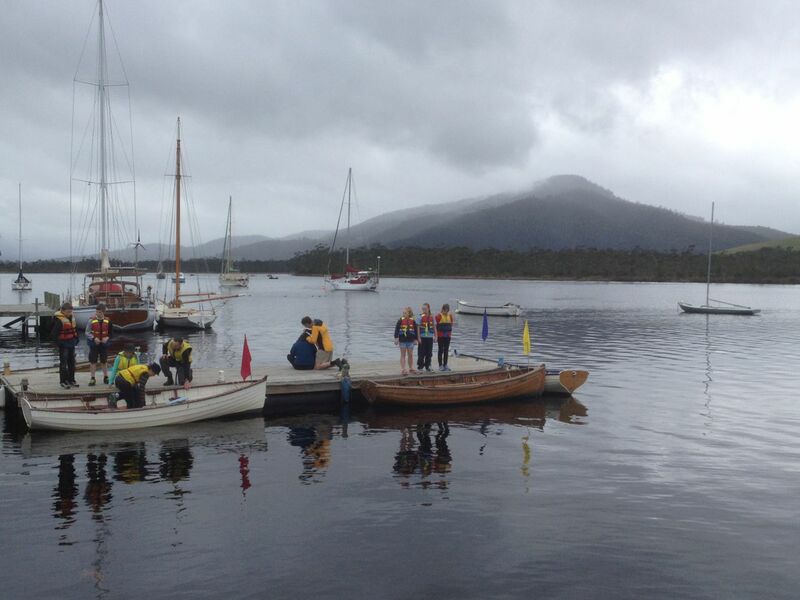 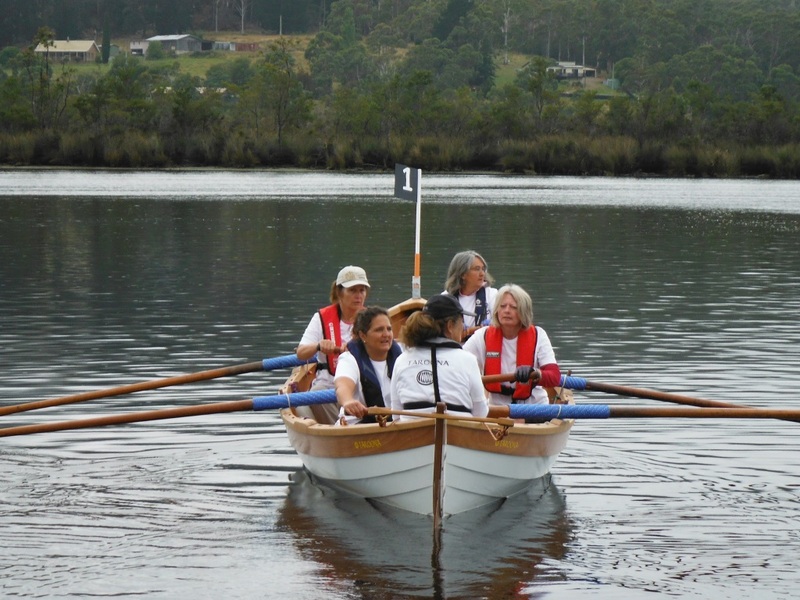 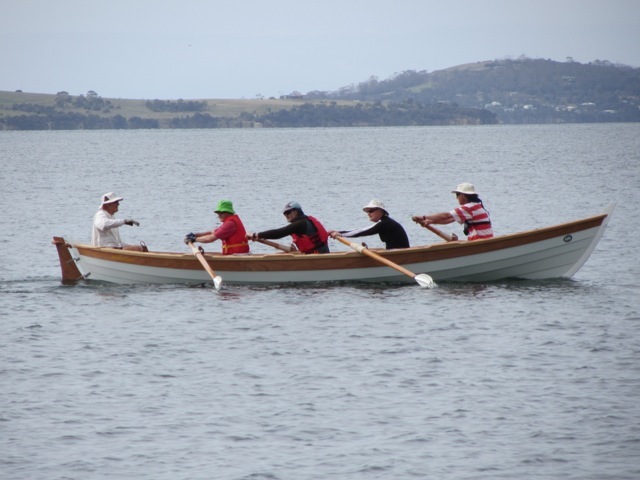 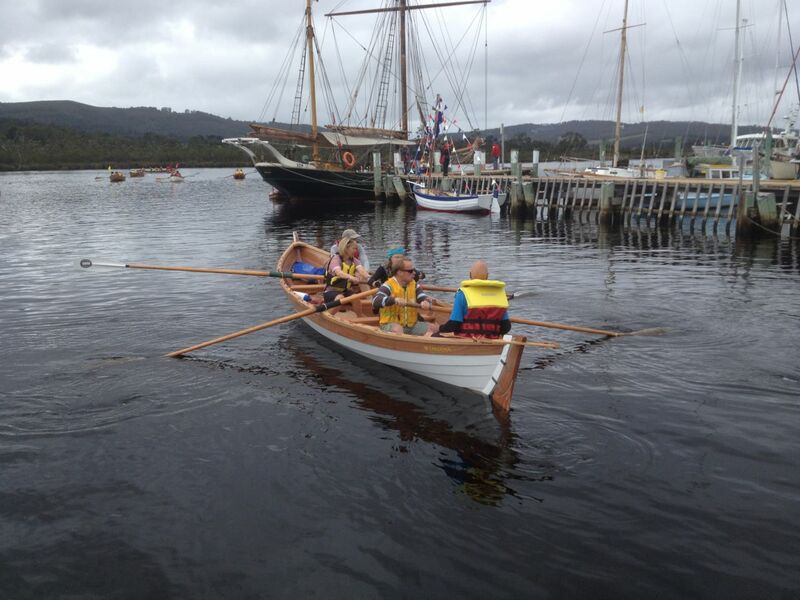 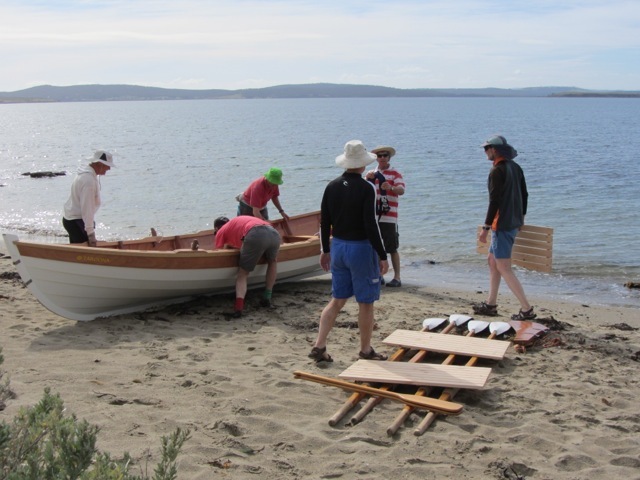 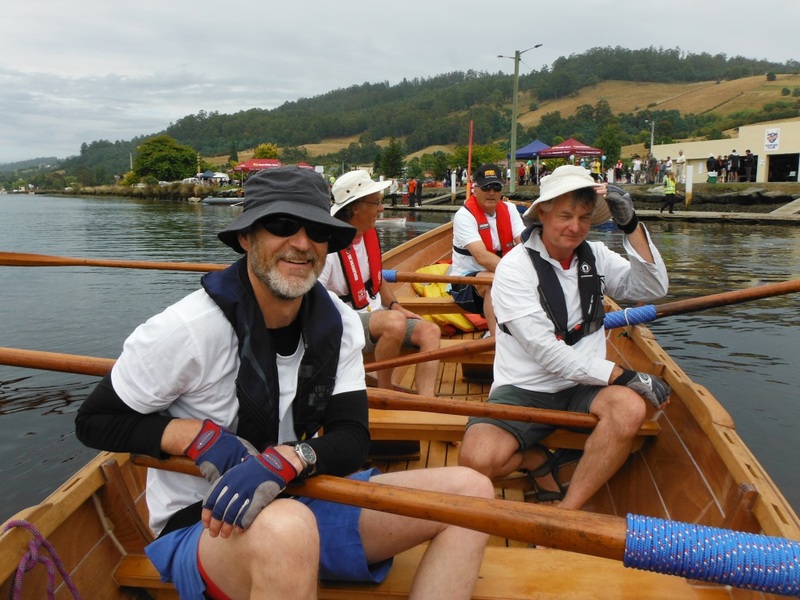 Since 2009, 104 communities like ours from around the world have shared in the joys of building as well as recreational and competitive rowing of the St Ayles Skiff. 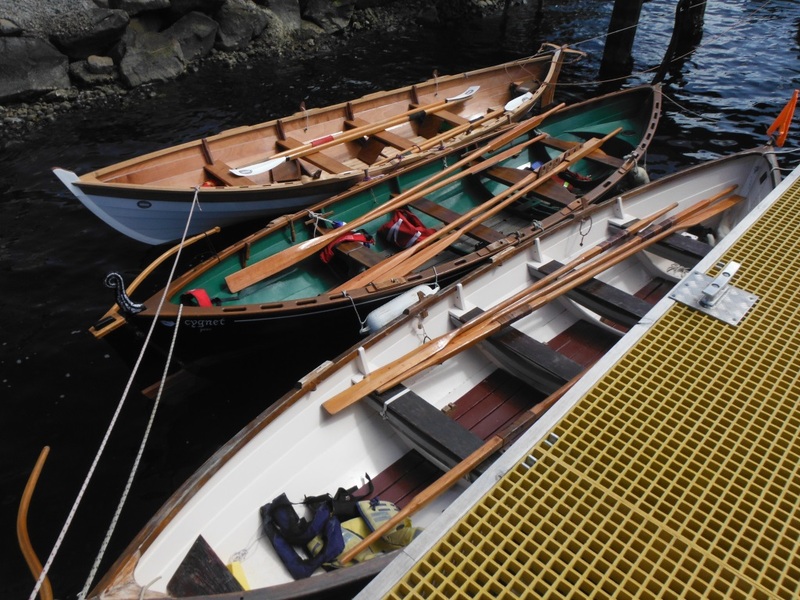 The original St Ayles skiff was designed for the Scottish Fisheries Museum by Ian Oughtred in response to a design brief encouraging communities of builders and rowers to enjoy coastal rowing for recreation while engaging other communities in competitive, friendly sport. 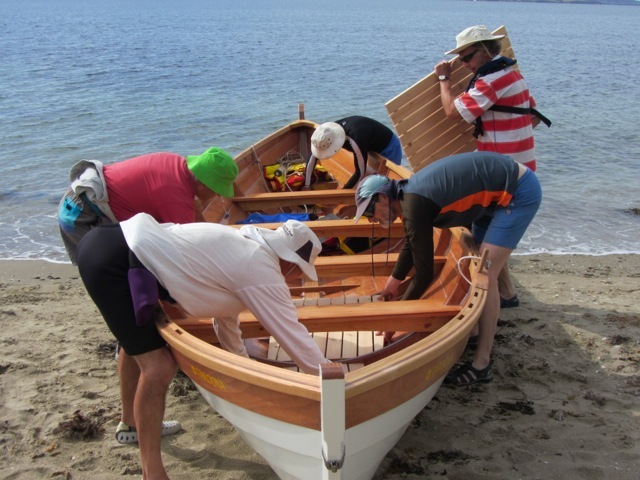 In doing so, they were reinvigorating a sport that was much earlier embraced by Scottish coastal communities. 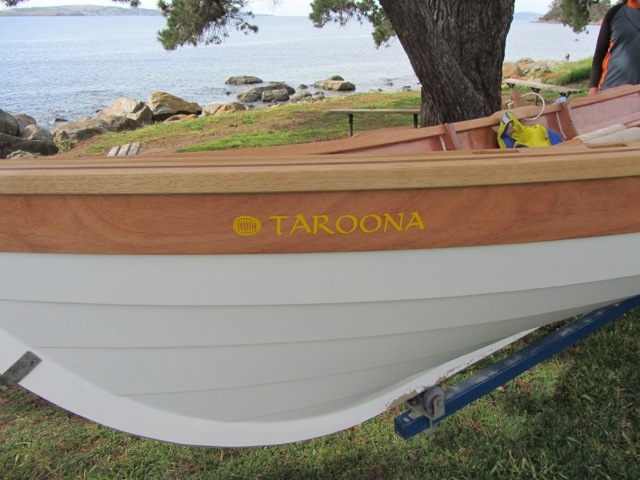 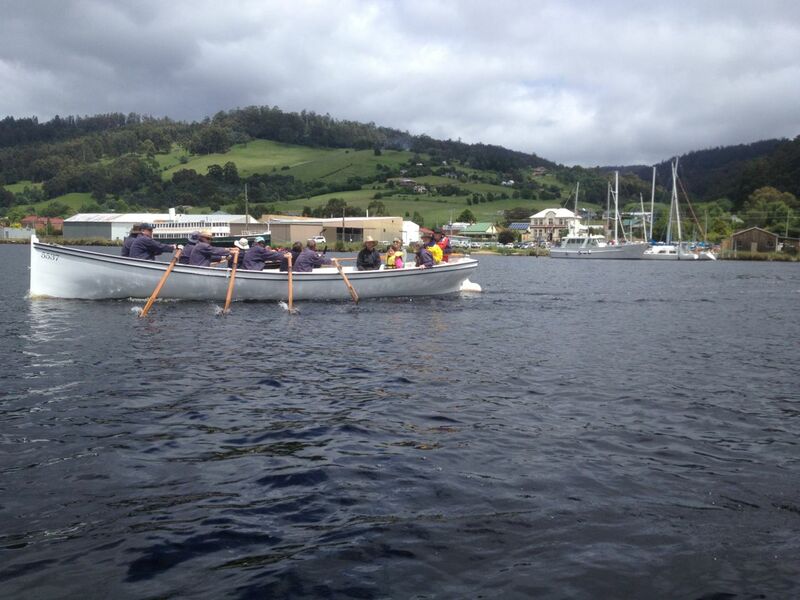 The Taroona Coastal Rowing Pilot Project received generous seed funding in 2013 from a community development grant of $5000 from the Kingborough Council Community Fund and since that time has engaged over 30 people in its construction, received many kind donations of cash, timber and generated much interest and excitement in our community. 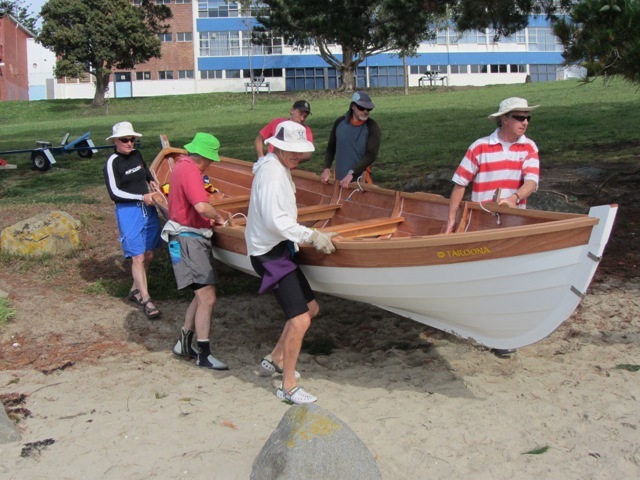 If you are amongst the lucky ones who can arrive on foot or bicycle, please do so as Melinga Place has no through traffic. 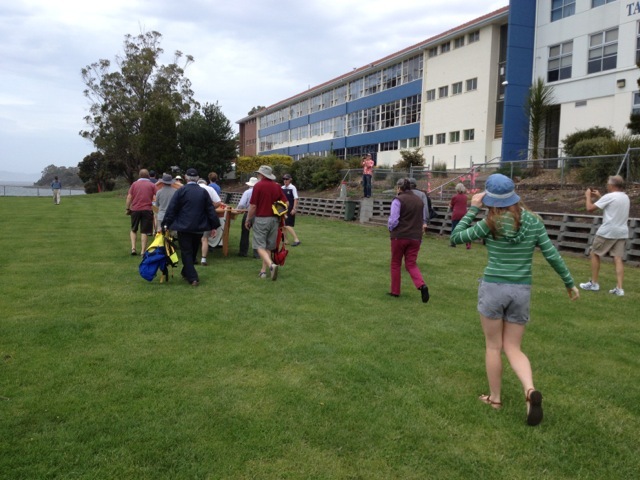 Otherwise please be considerate to local residents by parking in the Primary and High School parking areas or access roads off Meath Avenue. 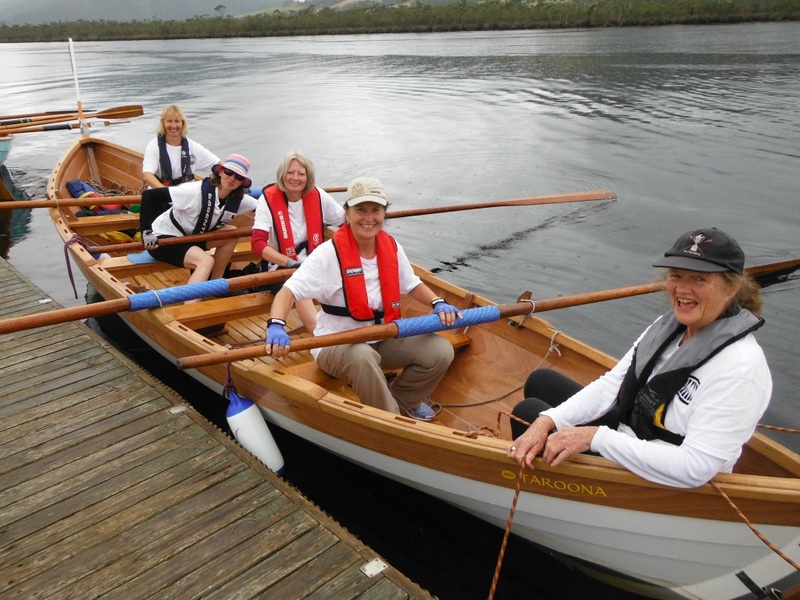 Bring your thermos for a cuppa as we’ll be supplying some cakes and biscuits to celebrate this great event. 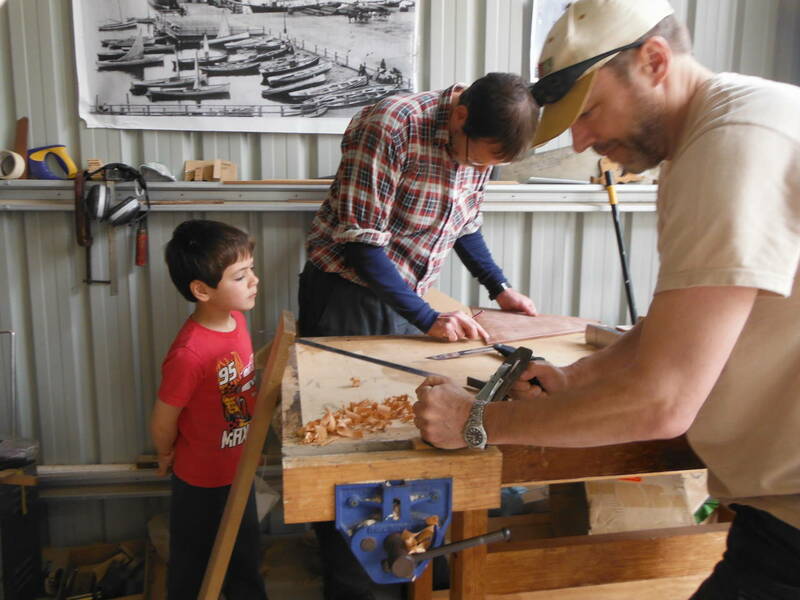 Damian has a well-earned family weekend this weekend. 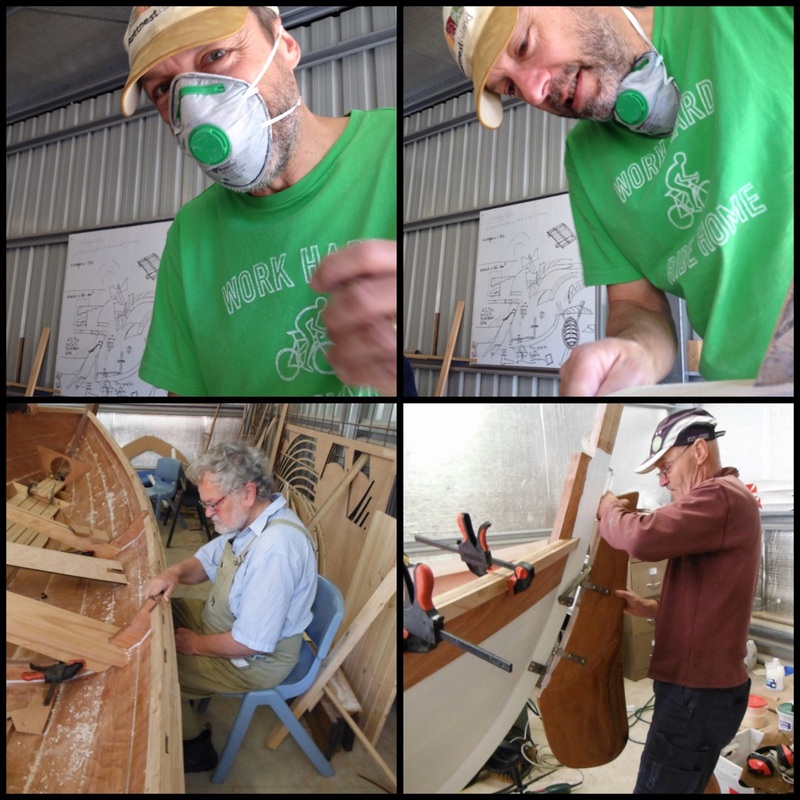 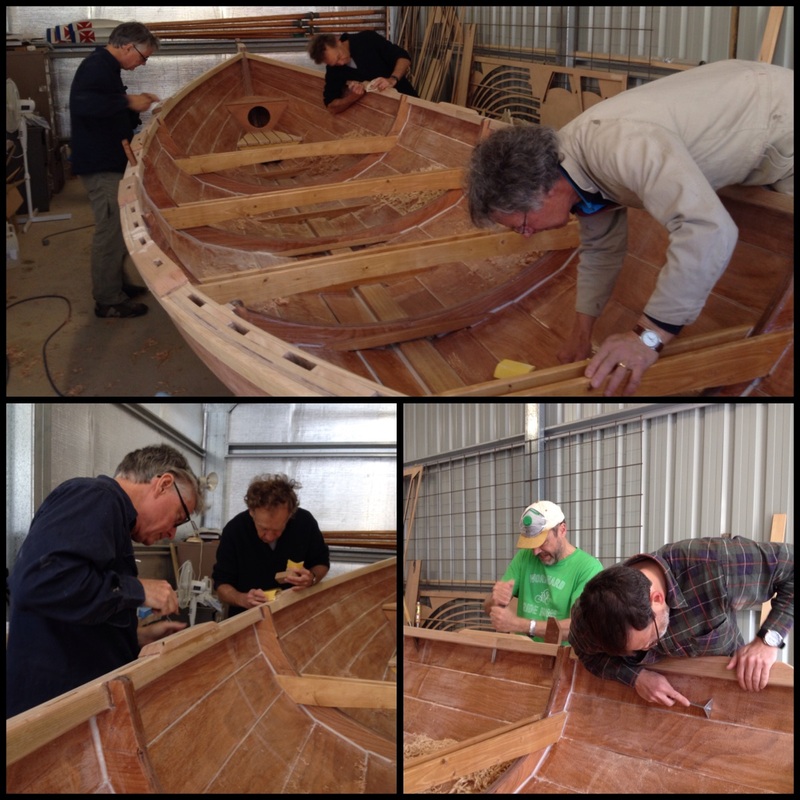 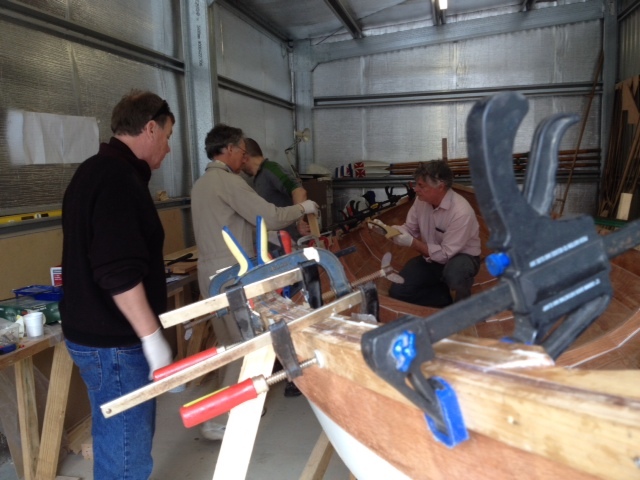 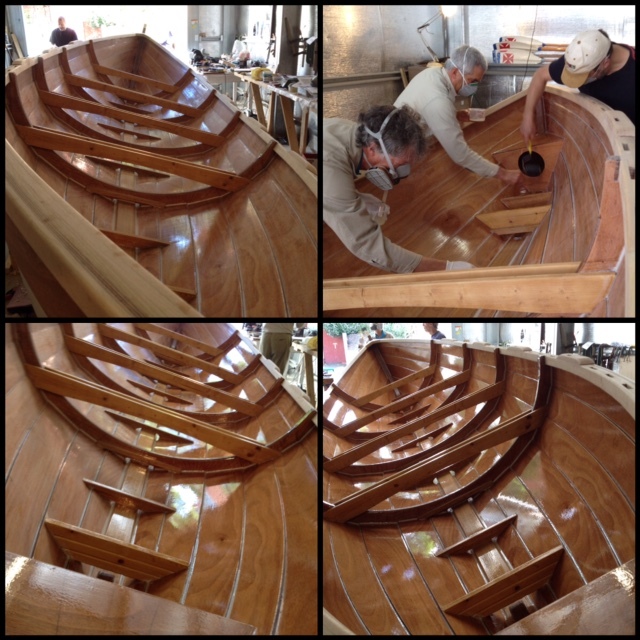 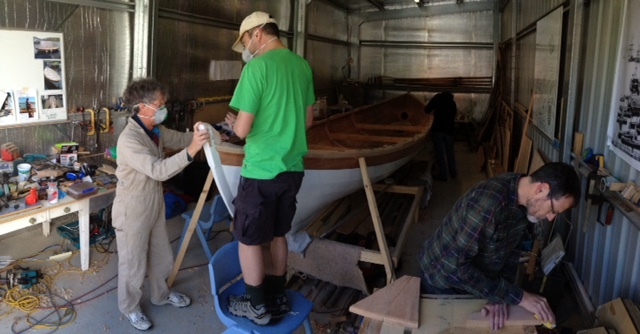 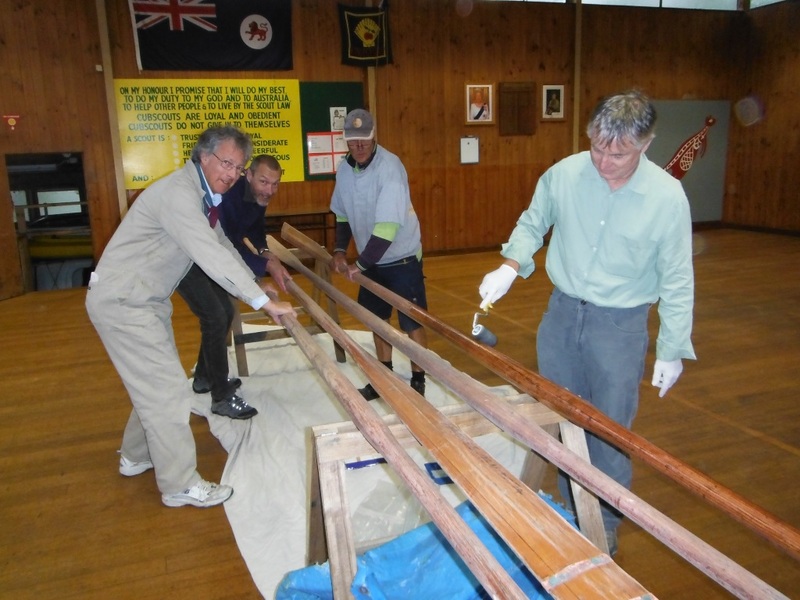 Dal, John, Basil, Rob and I will be there on Saturday and we need as many as we can get to assist with the final inside epoxy coat on Saturday and oiling the gunwales on Sunday. 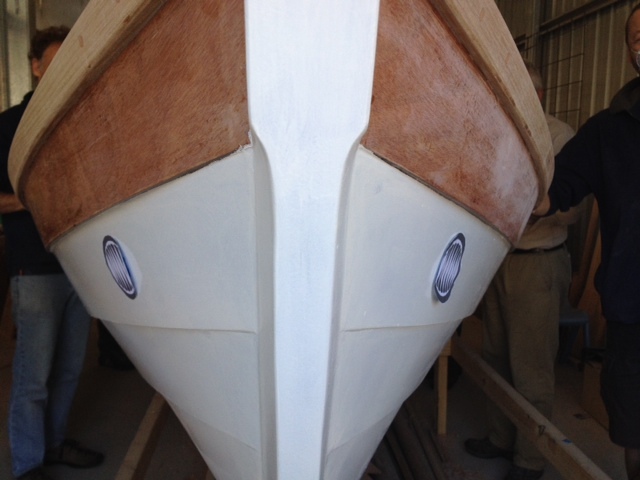 There are other small jobs to be done and then we have to get several coats of paint/varnish on the outside and inside. 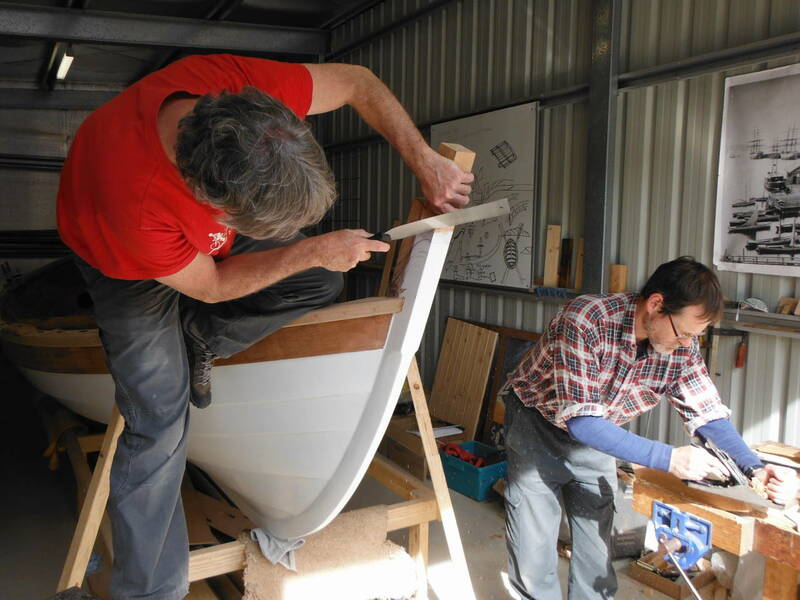 I do hope you can come and give us some of your time to help finish off this fantastic boat ready for the ceremony on the 8th at 2:00pm. 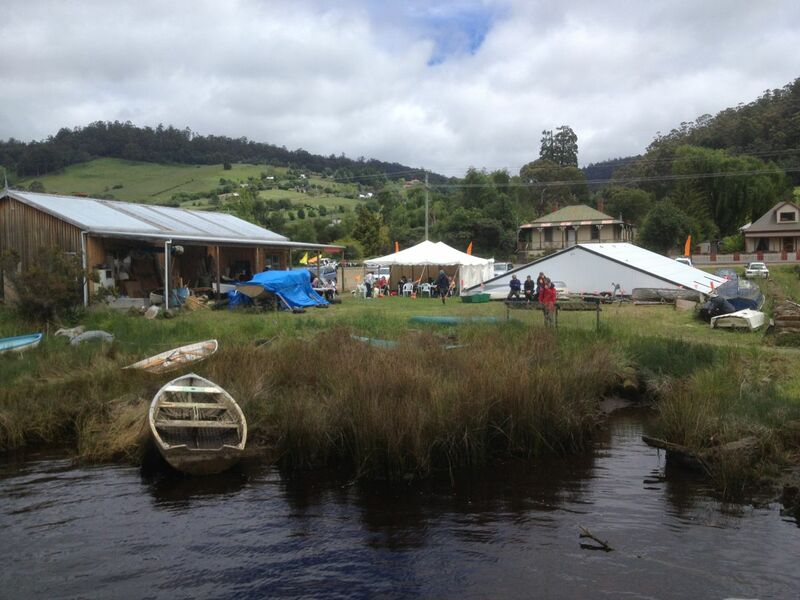 I will also be there today (show day) if you are at a loose end. 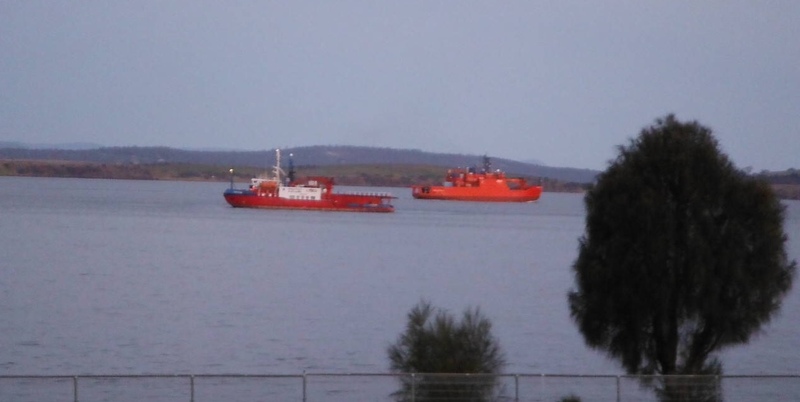 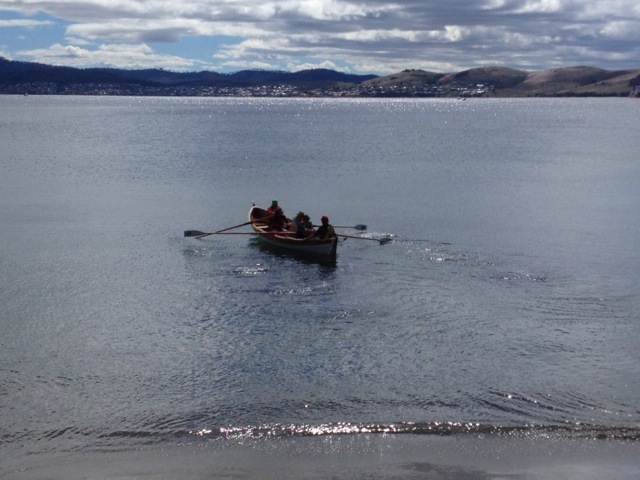 Antarctic ships from Taroona High while we worked. 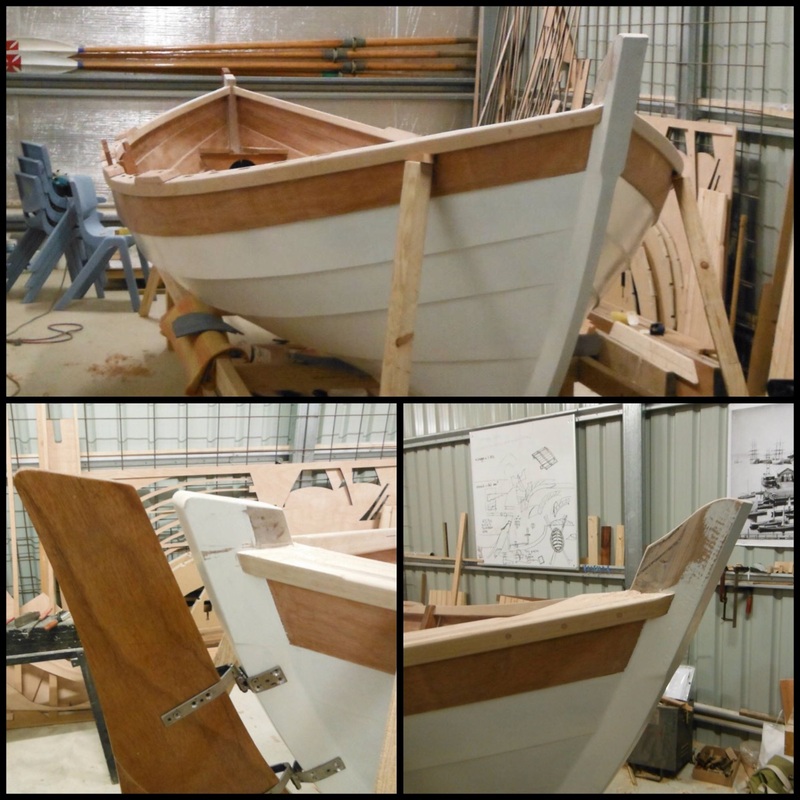 Progress last night. 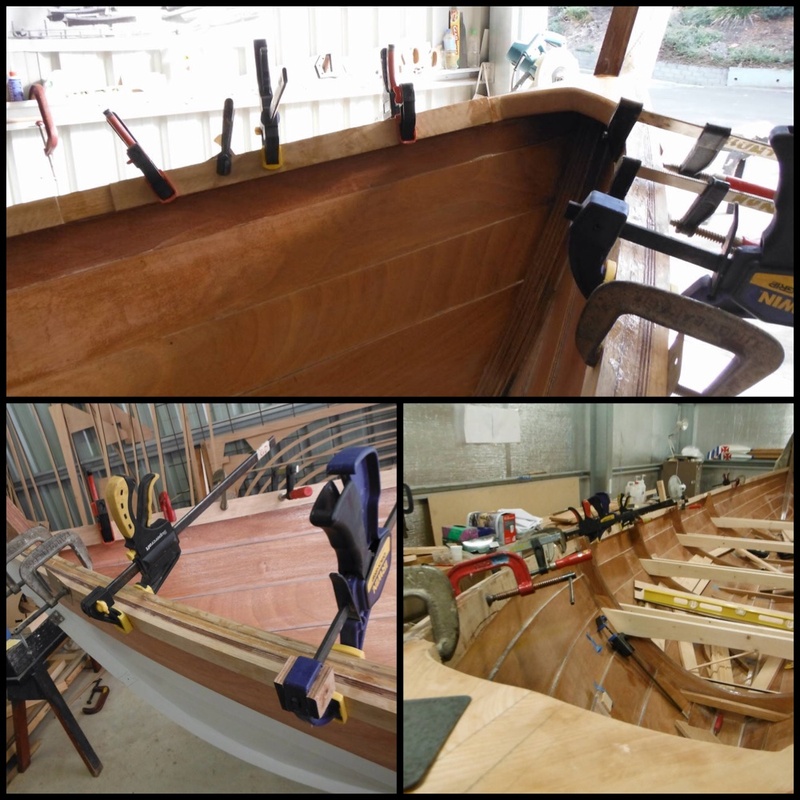 Stem and stern cut to shape and now she looks a beautiful vessel with a lovely shear. 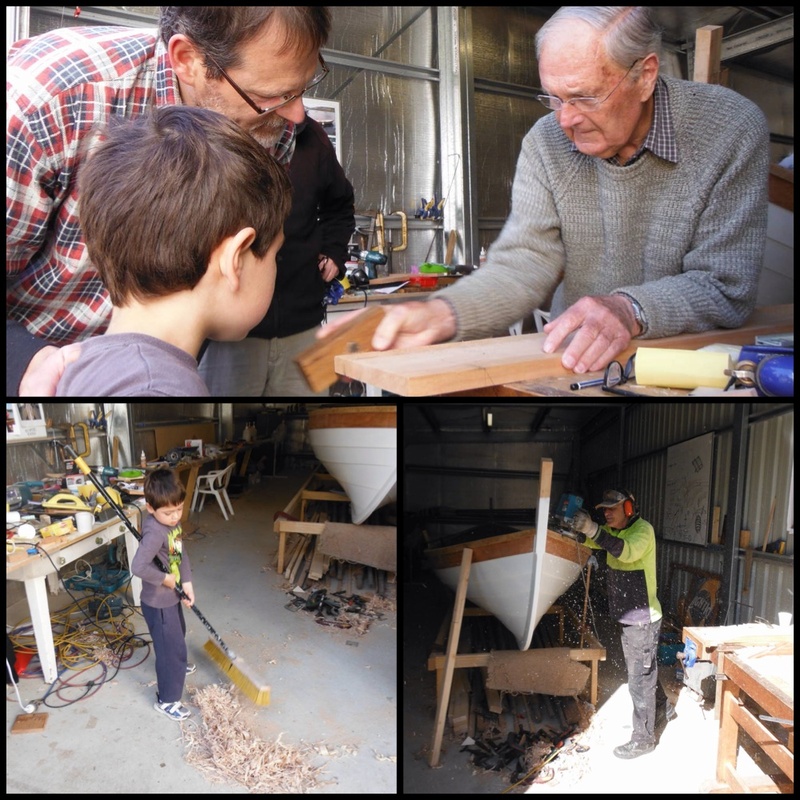 Guru Richard demonstrates use of a tool to Basil as son Daniel looks on then helps sweep the shavings with a huge broom…Nick uses the router on the gunwales. 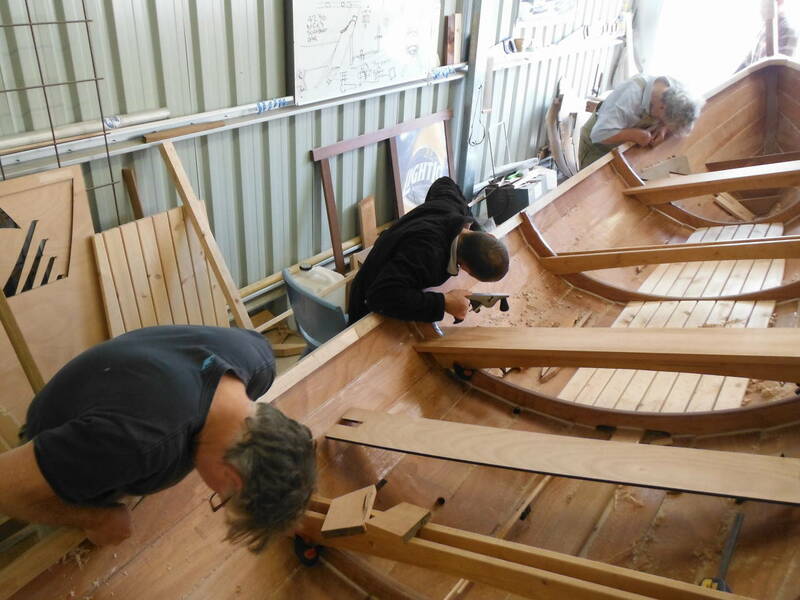 A: Hunting and removing glue dags! 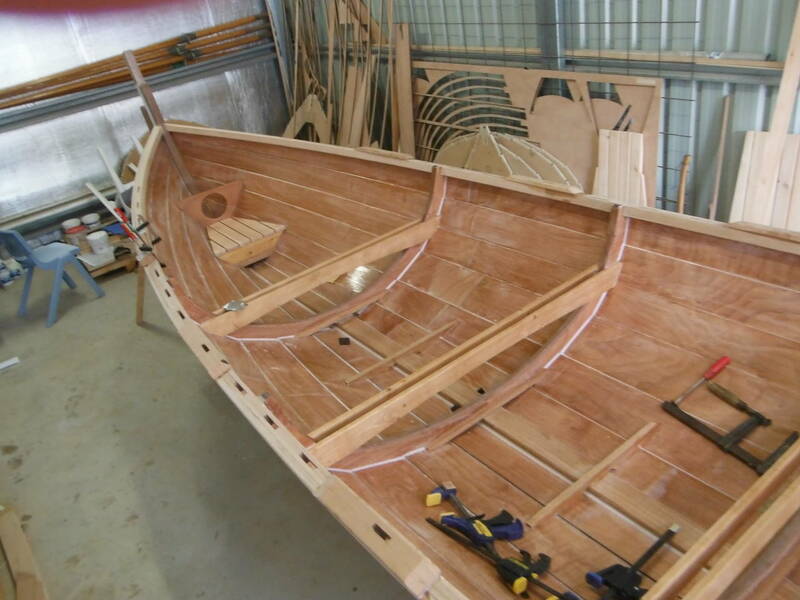 Another St Ayles Skiff on the horizon? 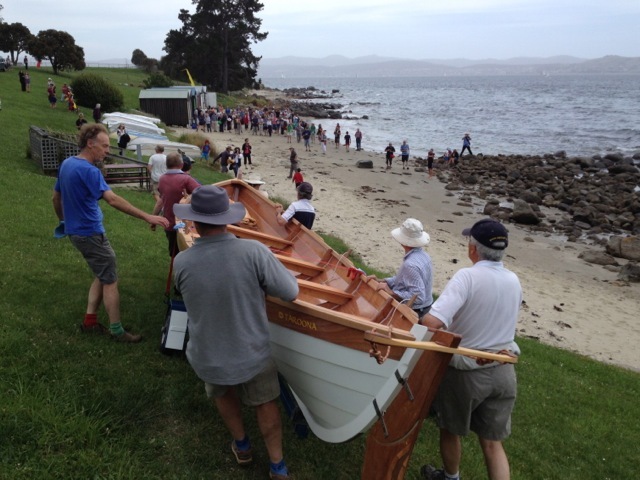 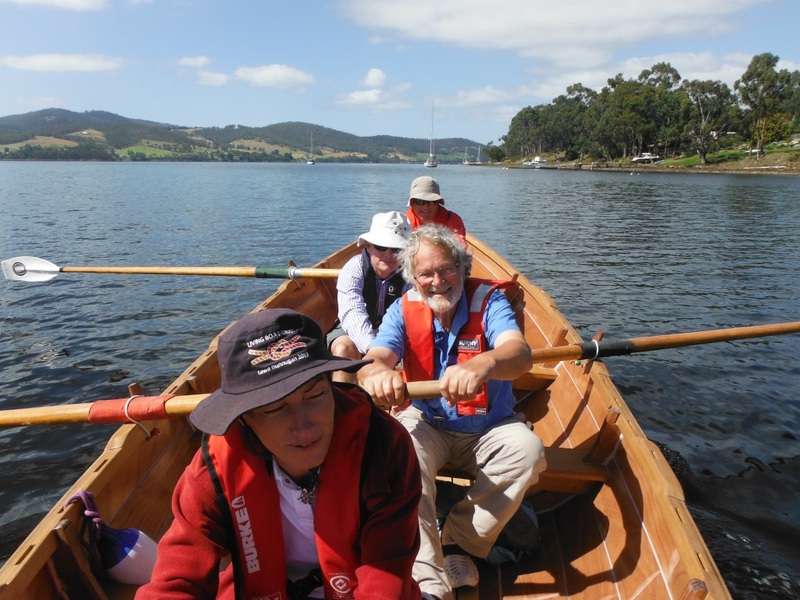 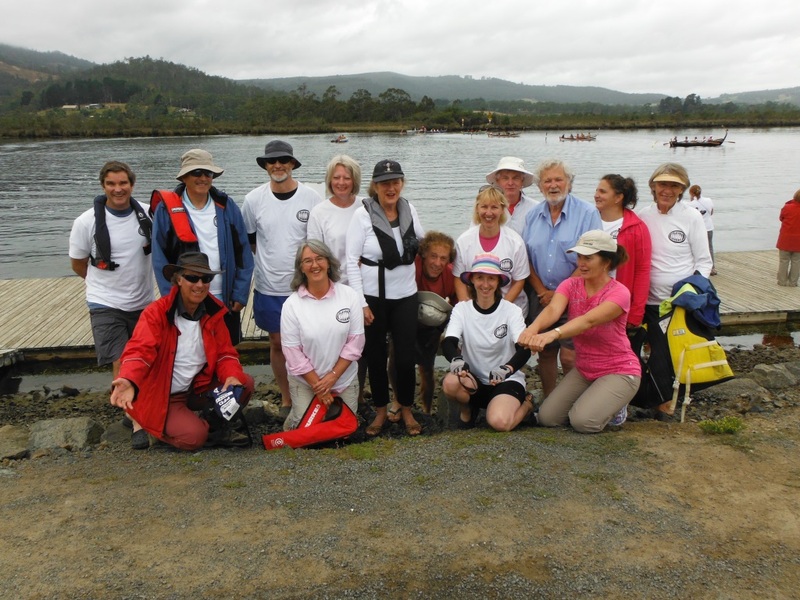 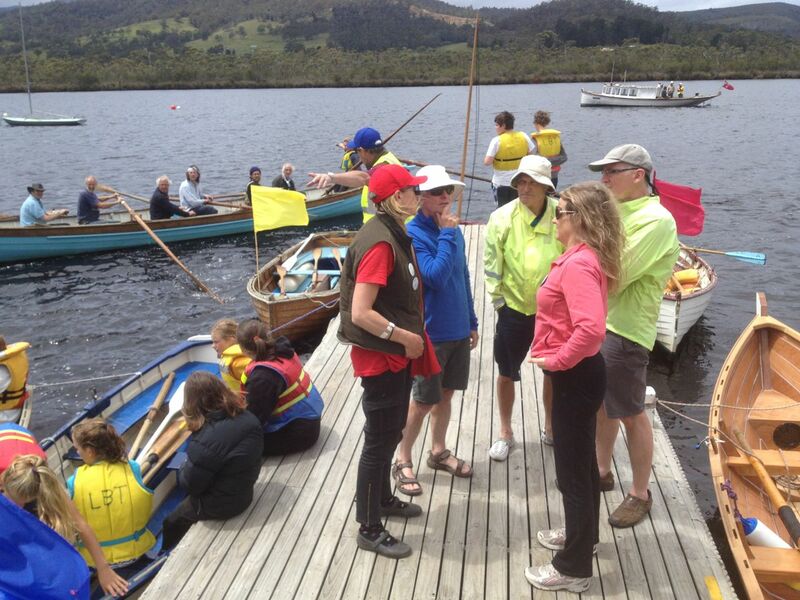 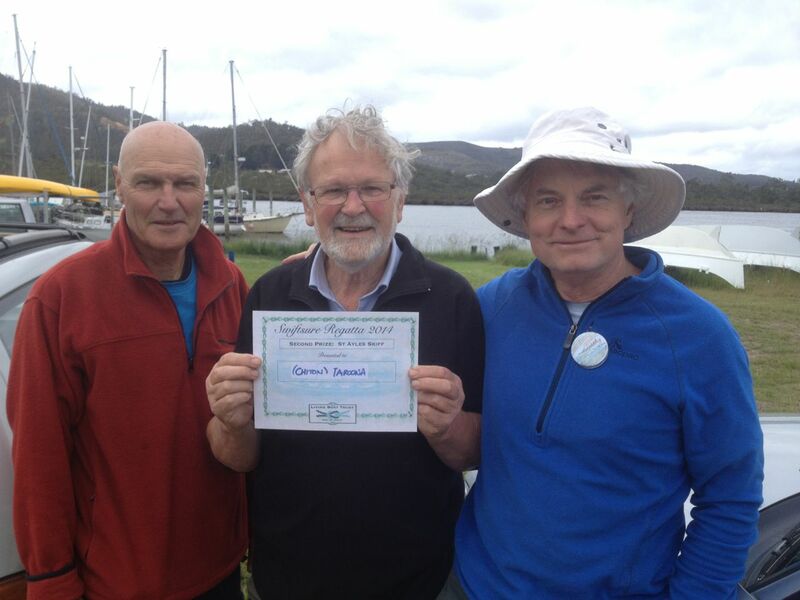 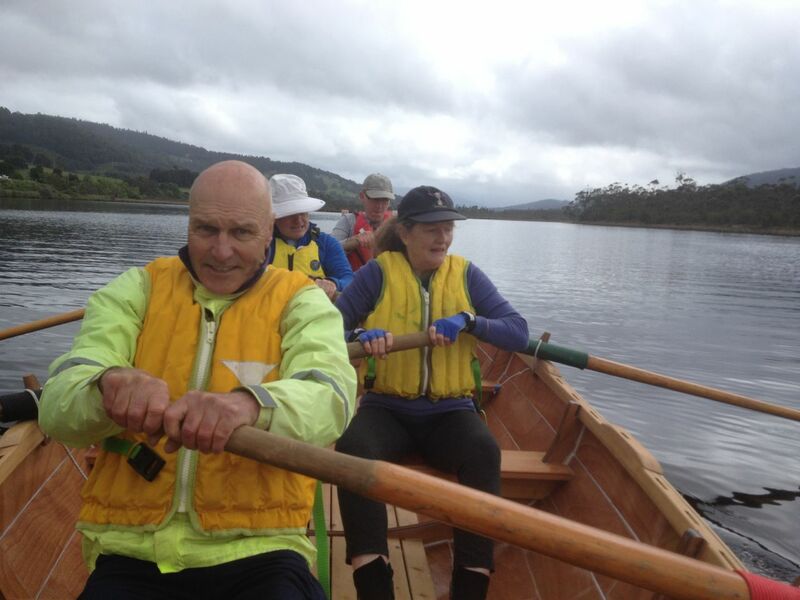 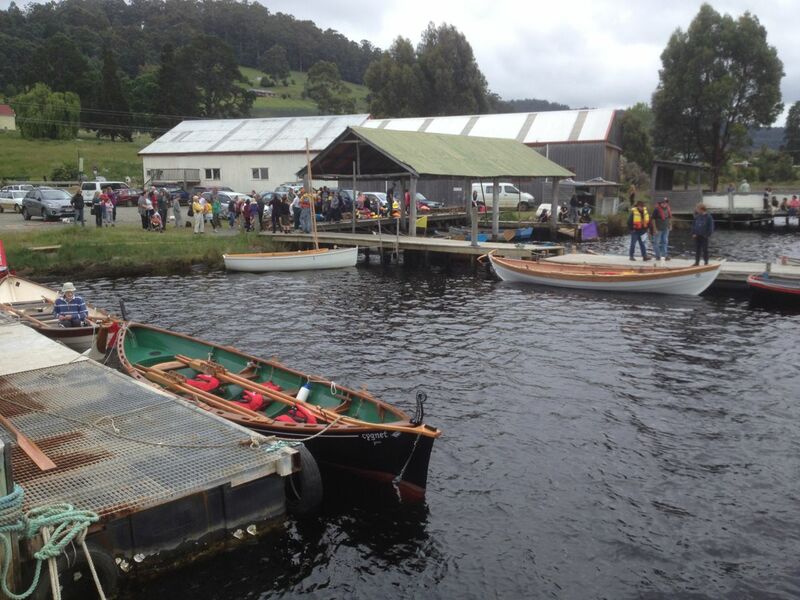 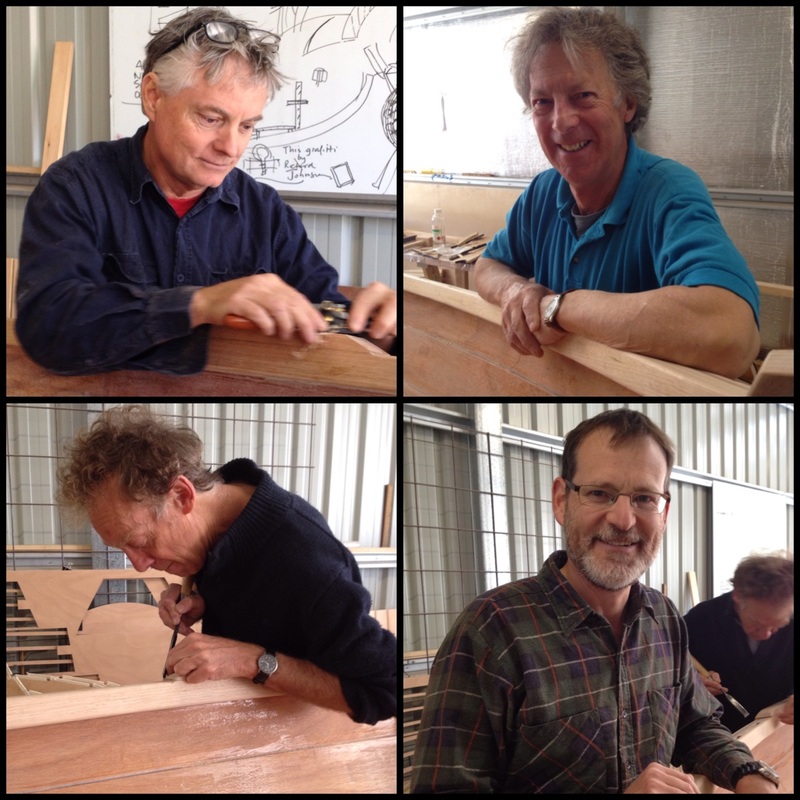 Visitors from Spring Bay Community Boatshed who visited last Saturday after rowing ” Imagine” on the Huon – they plan to build. 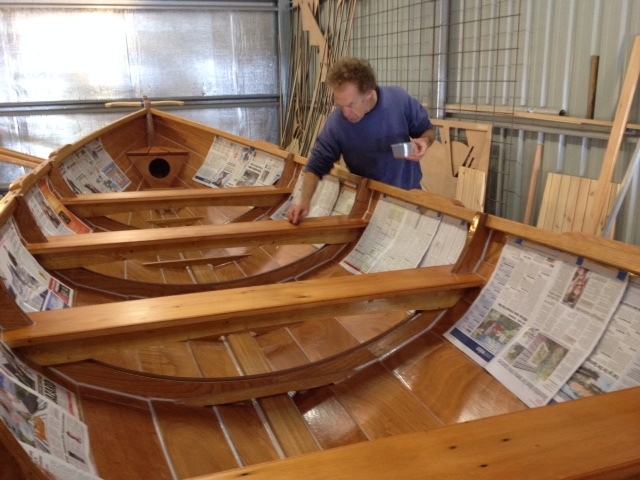 Michael and Damian cleaning up the gunwale.